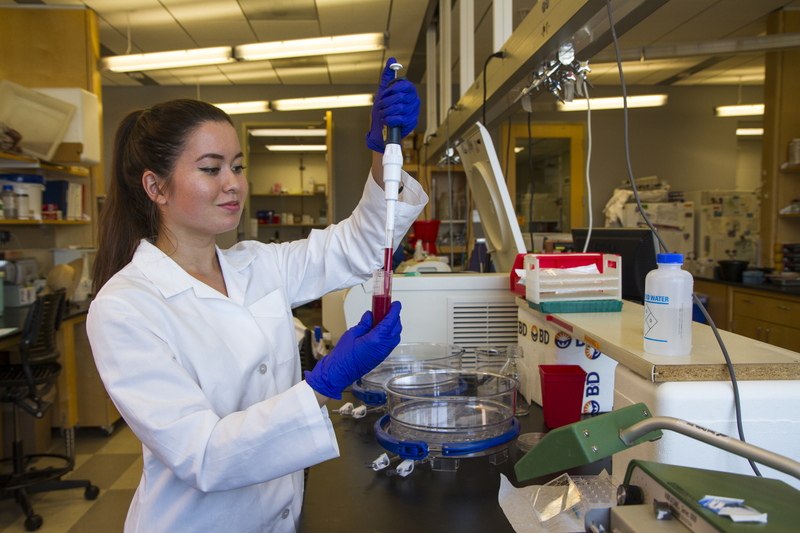 Get to know Ayumi Pottenger, an undergraduate student studying molecular and cellular biology in the hopes of developing treatments for those with Parkinson’s disease while elucidating some of the mysteries of the brain. In my current research, I study microglia—the immune cell of the brain—in a pre-clinical model of Parkinson’s disease. We are looking at a potential treatment of levodopa-induced dyskinesia (LID). LID is characterized by abnormal, involuntary movements and can be severely debilitating to those who experience it. There are currently very few options for treatment of LID. It is my hope that the work in this area can relieve the suffering of those with Parkinson’s disease, and elucidate some of the mysteries of the brain. I love being at the bench and working through an experiment. Every project brings with it so many possibilities. The outcomes can be fantastic or they can be disappointing, but they always teach me something which makes me a better scientist. I look forward to going to work in the morning because I get to do what I love every day. What or who inspired you to do this work? I draw inspiration from my family, particularly my mother. She immigrated to this country and faced a great deal of adversity so my siblings and I could lead better lives. When life gets tough, I remember that my mom didn’t sacrifice so much for me to give up on my dreams. I have a rare opportunity to do exactly what I love, and I don’t want to waste it. If you could have a dinner party with any three guests of your choosing (dead or alive), who would you invite? I would invite Malala Yousafzai, Ogino Ginko, and Rachel Carson. All three are trailblazers in their own ways, and they are some of my heroes. Malala is my age and she is already a Nobel laureate! Ogino Ginko didn’t become a medical doctor until she was in her 30s, and Rachel Carson didn’t begin to receive national recognition until she was in her 40s. They all changed the world in different periods of time and at different ages, which reminds me that it’s never too late to make a difference and never too early to start. I would tell incoming freshman that their future begins here, so they should prepare early and often. Louis Pasteur once said “Chance favors the prepared mind." Over four years, you will be presented with so many opportunities, from internships to competitions to scholarships to jobs. It’s one of the many perks of attending a large university. You should work hard to prepare yourself for these chance events, and you should never be afraid to submit an application, attend a meeting, or send out an email. Connect with your professors, find mentors, and network with your peers. College is what you make of it; what do you want your experience to be? Once you have decided that, you can make a plan of action and prepare for whatever opportunities come your way. What do you do outside of academics and research? Outside of research and school, I spend my time hiking, dancing, reading, and exploring Tucson. I’ve lived here ten years and this beautiful city still surprises me! If you were giving a speech at graduation, what message would you give to your peers about the future? In our fast-paced world, everyone wants to be at the top, immediately. I would tell my peers to enjoy the journey. You’ll get where you are going eventually, so why not revel at each step of the way? What tips would you give to students trying to get research funding? To any undergrad students trying to get research funding, I would recommend submitting applications whenever and wherever you can. With each application your writing gets better, and your ideas become clearer. You can learn what writing styles and topics work for you and what doesn’t. Don’t get discouraged if you get rejected—that is just part of research. Even the rejections can be learning opportunities.